They Hang Pictures, Don't They? Those familiar with the august Shelburne Museum might find it odd that its assistant curator is preparing for an exhibit by reviewing a shipment of mail-ordered odors. But that would suggest they don’t know much about how museum and gallery curators do their jobs these days. The popular perception may be that curators spend much of their time poring over dusty tomes — and, now, the Internet — in search of obscure details about a long-forgotten artist. Scholarship is still integral to the profession, but curators now also need to have a flair for show biz and some techie skills to help their institutions compete with digital entertainment. Art venues around the country are staging exhibits that would never have occurred to old-school curators — and, in some cases, were not technically feasible until recently. Simply put, museums are dropping the mausoleum approach, and several in Vermont stand out for their curatorial acumen. Rogers, 32, is one of a new generation of curators who are airing out fusty collections and using flash and glitter to lure audiences to special shows. He’s planning, for example, to uncork those bottled scents as part of an immersion experience he’s creating for visitors to “Circus Day in America: 1870-1950.” The show, which opens at the Shelburne on May 16, draws heavily on the museum’s own collection of 3500 circus figures and 500 circus posters. But Rogers also arranged loans from the Ringling Museum of Art in Florida to entertain and educate contemporary audiences who don’t know how Americans used to celebrate a big day under the big top. Rogers, an Oklahoma native who has never actually witnessed a circus, spent four years consulting some 400 books, talking with experts around the country and sifting through the Shelburne’s massive collection to help him craft the story of Circus Day. “A good curator is a storyteller,” says Aimee Marcereau DeGalan, curator at the University of Vermont’s Fleming Museum. For each of the six shows she organizes every year, she says, “I’m trying to have a thesis, or story, that will make it more understandable, more enjoyable” for visitors. Take one of this year’s exhibits, “Andy Warhol: Fashionistas and Celebrities” (which remains on view at the museum through April 25). One of the first challenges for DeGalan, 39, was to decide which snapshots to display of the 150 bequeathed to the Fleming by the Andy Warhol Foundation for the Visual Arts. For help in choosing — and in outlining the story she would seek to tell — DeGalan devoured 30 catalogs related to Warhol’s photography. Then came a debate over how to display the 85 selected images of such superstars as Calvin Klein, Muhammad Ali, Henry Kissinger and, um, Dracula. DeGalan says she “went back and forth” with colleagues, including Fleming director Janie Cohen, on whether the photos should be hung on walls or arranged in glass cases. “I didn’t want them framed. I didn’t want them treated as art objects,” DeGalan says. “I felt that putting them in cases would make them appear as they were originally conceived” — that is, as informal pics that were often later “doctored” by the pop artist. With that issue settled in her favor, DeGalan figured out, with the help of exhibition designer Perry Price, how to draw maximum attention to the relatively small-scale show in the museum’s Wilbur Room. They built a temporary wall that confronts visitors as they enter and offers introductory commentary by DeGalan. A miniature runway extends behind the wall and presents such locally famous fashion items as Burton snowboard wear and Obama Flashbags. Technicians from the university’s theater department were called in to spotlight the show — and story — that DeGalan had spent months conceiving and assembling. Coincidentally, Warhol also figures prominently in “Celebrity,” a show that will open at the Middlebury College Museum of Art on May 20. Curator Emmie Donadio worked with a college alumnus and student interns to organize a small exhibit that will include images of radical abolitionist John Brown, silent-movie comic Buster Keaton and Lucius Aurelius Commodus, a Roman emperor of the second century. Highlighting some of Middlebury’s portraits in a range of media and across a wide time span “seemed like a good way to make use of the permanent collection,” says Donadio, who has worked at the museum since 1990. 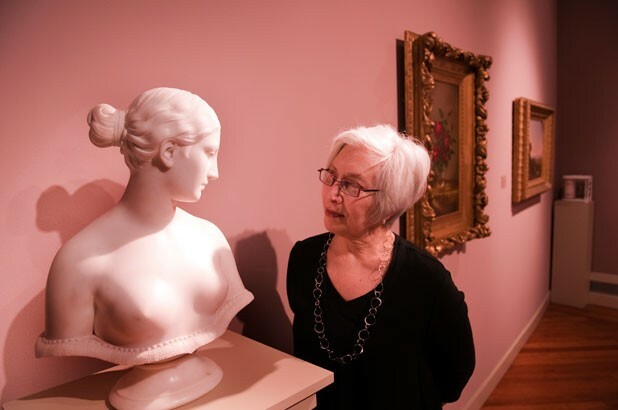 When they’re not organizing temporary shows and, in Donadio’s case, teaching art history courses, Vermont museum curators devote a lot of their time to maintaining, refreshing and expanding their institutions’ permanent collections. That’s an especially enormous task at the Shelburne, which owns more than 150,000 objects. The Fleming’s holdings include about 25,000 pieces collected by the university over the past 185 years, while Middlebury’s collection contains some 3000 works donated or purchased since 1970. Many major museums have large curatorial staffs, with specialists assigned to oversee specific areas — European paintings or American antiques, for example. But at the Shelburne, which certainly qualifies as a major museum based on its sprawling size and scope, Rogers and senior curator Jean Burks are responsible for the whole shebang, with curatorial help from director Stephan Jost and two exhibition preparators. “This collection forces you out of any box,” says Rogers, who concentrated on modern design while studying at the Smithsonian-Parsons School in Washington, D.C..
Rogers supervised the renovation of the museum’s 140-year-old lighthouse while planning the display of works by Vermont folk artist Warren Kimble in the museum’s new galleries. These days, though, when Rogers isn’t thinking circus, he’s thinking ducks. He’s been handed responsibility for the museum’s 200-piece decoy collection, which ranks as the greatest in the world but has been dulled down by a presentation that fails to highlight the skill of the carvers or tell the potentially absorbing story of wild fowl and those who hunt them. Rogers will be working to remedy those deficiencies over the next couple of years. On a recent tour of a portion of the decoy display in Dorset House, he spoke of updating the lighting and color schemes and taking some of the ducks off their perches inside glass cases to suspend them in mid-flight from the ceiling. Rogers isn’t yet certain how to proceed, however — partly because he knows almost nothing about decoys. His education will involve hands-on inspection of all the pieces and consultations with experts as he considers whether to arrange the ducks by species, by carver or by some other category. There’s also the question of how to integrate the collection’s gun component with Rogers’ inchoate plan for initiating a conversation about conservation. “It’s all very vexing,” he says. Back in Burlington, DeGalan is pondering ways of coaxing the Fleming’s visitors up to the balcony of the Marble Court and, from there, into the seldom-entered rooms that house European and American art. She plans to jazz up the selection of mainly 19th-century New England paintings that ring the balcony by temporarily replacing four of them with contemporary works. Working with interns, DeGalan has already added wall texts and produced a podcast that provides background on the artists and their works. Standing on the balcony, DeGalan says she’s willing to take risks in her effort “to get people to at least come up here.” And that’s possible at the Fleming. Scholarship remains central to DeGalan, who earned a PhD at Case Western Reserve University in Cleveland, where she focused on 18th-century European painting. She’s planning a small loan show built around Jean-Honoré Fragonard’s “The Shepherdess” (1765), which is part of the Fleming’s permanent collection. DeGalan is also “really anxious” to start researching a Fleming painting attributed to Joseph Wright of Derby, England, to ascertain whether it is truly one of his rare portraits. The Shelburne, too, is constantly augmenting its collection. It recently purchased two duck decoys at an auction house in Boston, for example, and is frequently offered gifts from “our very generous set of donors,” Rogers notes. Tending to a permanent collection isn’t a concern of Firehouse Gallery curator Chris Thompson; the contemporary art space on Church Street doesn’t have one. And Thompson counts that as a blessing. Thompson, who is also an artist focused on “pretty nerdy stuff” like information graphics, exercises that freedom to stage primarily subject-based shows in which artists are encouraged to take chances. In recent years the installations, too, have grown edgier and utilized more technology, such as video games and audio guides accessed with visitors’ cellphones. Partly, or perhaps primarily, because of its downtown location, the gallery attracts so many visitors that it ranks as “one of the more heavily attended contemporary art venues in New England,” Thompson says. Audience demographics vary from show to show, but the Firehouse does draw a significantly younger crowd, on average, than do the Fleming, Shelburne or Middlebury museums. The Shelburne is keen to keep them all coming, since it depends heavily on gate receipts. That accounts for the decision to organize a Round Barn exhibit of pimped-out motorcycles last summer, which led some traditionalists to sniff disapprovingly. Rogers admits he hated it, but allows he had “a great time at bike week in Daytona Beach,” where he went as part of his curatorial research. At Middlebury, “Success is never measured in terms of attendance,” Donadio says. The museum’s location in a small college town in a rural county doesn’t encourage many walk-ins, she notes. Besides, the Middlebury art museum is primarily concerned with meeting the needs of the college’s curriculum, although it also strives to interest the community in its shows and to accommodate regular visitors from nearby elementary schools and nursing homes, Donadio adds. The Fleming faces the same town/gown dilemma. “We’re up on a hill, and there’s a perception of the museum as elitist,” DeGalan says. The Fleming does cater mainly to students, but, she admits, “We’d very much like to bring in more people from Burlington than we do.” One idea for a new enticement? Singles’ nights, for which the Fleming would stay open late. Bartending and deejaying? DeGalan may have to add those skills to her already wide-ranging curatorial repertoire.